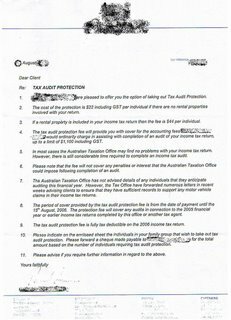 So I received a letter the a few months back from my accountant offering 'Tax Audit Protection' - As you can see from the attached letter the investment would only cost $22 and protect me for upto $1100 worth of costs if I was audited. Not a bad insurance policy to take up at such a low price, I am sure a large number of this accountants clients took this offer up. For those of you who have read about Maslow's Hierarchy of Needs - Safety (Security/Protection) is very very important to people and one of our core needs. Lets look at it from the Accountants point of view - Firstly from an cost balance of view. They will need to sell 50 'policies' for every audit they need to complete. I am not sure of the odds of people getting audited but I would almost bet it's less then 1 in 50.... Obviously the Accountant can look back trough their records to see what % occurred in the past, to make sure the bases are covered. Secondly, what are they really selling? Well unlike most services accountants offer - they are not selling time? Generally you pay the account for their time to complete a BAS statement, File a return etc etc. 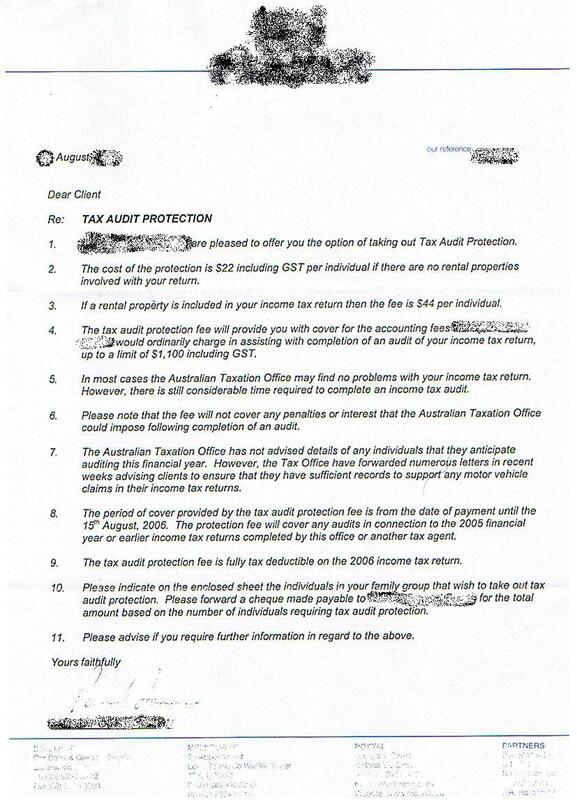 As the $22 is not covering a direct effort on the accountants behalf, it's merely a opportunity/possibility. If the account sold 1000 of these to their large client base, that's $22,000 of additional income they would otherwise wouldn't have had. How can you do the same in your business? - An 'All Purpose Tradesman' could sell call-out protection; For $250 you are covered for 10 hours of work if/when needed in the next 12 months. - An 'Auto-Mechanic' can offer a labour protection: If your car breaks-down in between scheduled services, $88 will cover the labour to fix the job. I like the ideas you are sparking with this post Pete. The only problem with a service like this is it is proactive rather than reactive. It's always harder to sell prevention compared to the cure.